possesing innate wisdom and a lifetime's spent in the Dharma Teaching and colleges of Tibet. Rinpoche has returned from Tibet. He has stated that his Darma-teaching is to be here in America. Compassion Fellowship Organizers have secured a house for Ripoche to live in & give regular Dharma Teachings... For more information click on the link above. 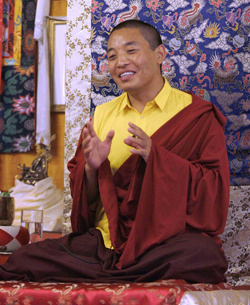 Rinpoche has been here in America for a number of years now. He has generously given us his dharma teachings, advice, empowerments and friendship. This has been very fortunate for us. Now it's time for Rinpoche to return to Tibet to visit his monasteries. In Lhasa he will be giving the Guyagharba teaching to the monks, nuns and yogis who have been waiting patiently. Rinpoche will also be visiting Golok and in particular Tashi Gomang, which has been his monastic seat for several incarnations. Rinpoche sees this trip as a special opportunity to make an auspicious connection between his friends here in America and his people in Tibet. Rinpoche has several projects in mind. In his homeland, at Tashi Gomang, he is making a new school for 40+ young children from the area to teach them to preserve the traditional rituals and practices of dharma. The people there are very poor. Many of the children don't have food or warm clothing. The children who come to study, have to sleep on the floor of the school now because there are no beds for them. Rinpoche would like to improve the situation for the children by feeding and clothing them as well as purchasing beds and making a proper facility for them. Also, Rinpoche is responsible for several monasteries in central Tibet. These are some of the oldest monasteries in Tibet, dating back to the early Ngingma period. The sanghas at those monasteries are good practioners and are actively involved in pure dharma, but there is virtually no economy in that part of Tibet and those practioners are lacking even the most basic living requirements, such as warm clothing and decent food. Rinpoche would like to take the opportunity provided by his visit to those monasteries, to give them clothing and food. Rinpoche has one more project in mind. His previous incarnation, spent his entire life in retreat. He was a great practioner. It is said that the area where his retreat hut is, is blessed. However, the retreat hut is deteriorating from exposure to the elements in the severe Tibetan weather. Rinpoche would like to restore the hut so that Rinpoche and other qualified retreat lamas can keep up the tradition in that special place. These three projects will all require that Rinpoche be able to bring funds with him from the West.